Discussion in 'Australian Lizards and Monitors' started by nuttylizardguy, Nov 2, 2018. I have a pet 3 year old female eastern water skink and recently found someone who had a subadult / juvenile male eastern water skink that was for sale ( surplus to their needs - too many males in their collection , was a holdback ), I've bought him already ( very hard to find captive bred eastern water skinks and I've wanted another ever since I bought my girl ). I'm willing to house him separately to my girl (introducing them to each other only to breed) , but would prefer to house them together as a pair after he's settled in and served his period of isolation (quaranteen) in a separate holding tub. I seek advise on safely introducing him to her (he's a little smaller than she is) , any advise on how to safely introduce him to her with a view to keeping them together as a pair and perhaps breeding the pair will be appreciated. 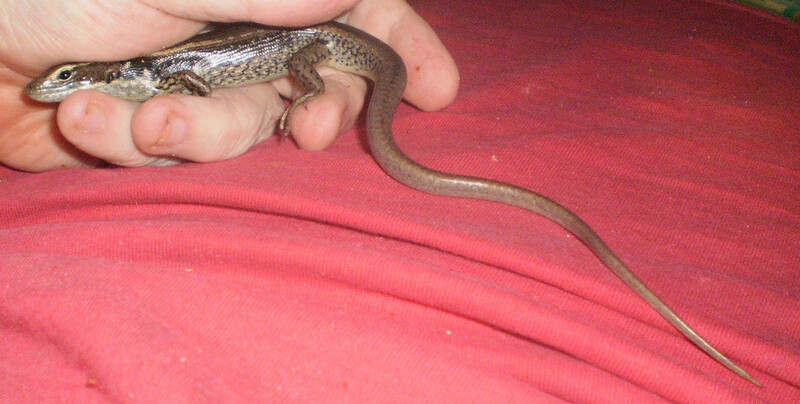 Seems there have been no captive bred eastern water skink keepers / breeders here lately … ? No responses warning against continuously/permanently housing two or more eastern water skinks together as a breeding group must OK providing the tank is large enough and there are multiple basking spots and hides . So I'll stick to my plan and give the subadult (yearling ?) male eastern water skink a month or two to settle in and to make sure he's not carrying anything nasty then rehouse him with my 3 year female eastern water skink in her converted 149L ALLSET tub (W:575mm H:480mm L:790mm) or build a 1.2m L x 0.6m W x 0.6m H tank to house the pair in the new year. Water Skinks are fairly social as reptiles go. You very commonly see them living in groups in the wild. When I've kept them (I kept a closely related species, Eulamprus tympanum) I kept them together and never had issues. I'd probably be reluctant to introduce new animals of greatly different sizes, but as long as they're well fed, have enough space and the size difference isn't huge you should be fine (no guarantees and if you have trouble don't blame me! ). If you have multiple basking spots you're certainly going far further than I ever did! They're really tough critters and I never managed to get any of them to have any problems! At this time of year I'd probably stick them straight together in the hope of getting babies this summer. They're not prone to parasites or other nasties, so personally, I'd put them together and quarantine the male with the female (assuming you have other herps) or just not worry about quarantine if they're your only two. I've also often seen 2 or 3 water skinks peaking out from under my aircon or around my pots (I grow herbs and berries). But I assumed they were all relatives (mothers, sisters, aunties, and their offspring juveniles). I've seen a couple of wild adults in my garden lately who are very plump and I think are close to delivering a bunch of baby water skinks . Skink baby-boom coming I think. I'll still give my new subadult boy a month or so settle before placing him in the big tub with my girl …. I want to get him a little bit tamer and more relaxed with being handled by me when I need to clean the bedding , replace the water and give him more BSFL , crickets and mealworms to eat, this will likely take a few weeks once his relocation stress has been worked through. I will need a larger water pond (my current one for each is fine for just one water skink , but not big enough for an adult and a subadult to share (soak/bath in together). I'll be building a 4ft x 2ft x 2ft tank for their forever home too. He's been spending a LOT of time studying my wife and me , and my other pet lizards when I have them out. Not very happy about being handled , but will take a mealworm or cricket from my fingers (which is a good start) , I don't think the breeder handled him very much. Water Skinks are very interesting lizards. I spent many, many days from Spring through to mid Autumn over a period of 8 years sitting and watching a huge colony of them that resided among the rocks piled along the banks of the McIntyre River when I lived in Inverell. What I noticed was that despite living in a colony each individual lizard (both male and female) had their own preferred shelter site with an accompanying and adjacent basking site within a territory which varied in size from about .5 of a square metre to around .7 of a square metre and spaced at a distance of between 1 & 2 metres dependent upon the number and nature of each shelter sites. During all seasons both sexes demonstrated that they would not hesitate to attempt to ward off any intruders that encroached on their little piece of territory with consistent vigorous head bobbing and arm waving. During Spring adult males of equal size and build would regularly engage in combat which commenced by circling and grabbing the base of opponents tail as close to the rear legs as possible and holding on with a tight grip. If neither opponent aborted the fight then this would escalate to grabbing an opponents leg, then head and eventually elevate to the point where it would develop into a wrestling match where the final outcome was determined by the victor getting the best of 3 throws. I've never kept them but I've had friends that have and heard both good and very bad outcomes when keeping them in the same enclosure, especially as adults. From what I gather. the best and most success way to keep them is to provide a good size enclose with multiple basking spots and shelter sites. There's a few videos on Youtube that show the initial stages of combat. One other thing that might be worth considering is introducing them on neutral ground. Cris - that sounds a very reasonable approach , my bigger older girl may well take exception to the slightly smaller subadult male being placed in her tub (even if it's the biggest tub I could find), so introducing the pair to each other in a new full sized tank with at least 2 hides and two basking spots sounds like my best approach. 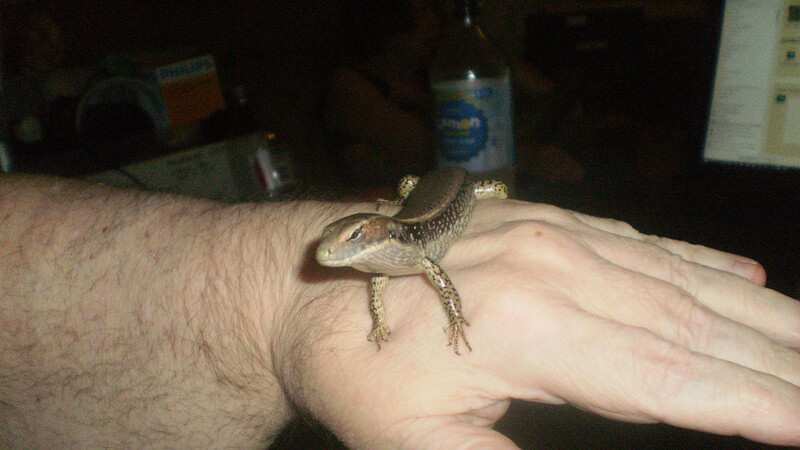 I obtained two Southern Water Skinks at this years Victorian Expo and within a week one had killed the other. I had assumed this was because they were both male but am unsure as there is not a lot of information available online. I also purchased two Whites Skinks, who also fought, luckily I noticed this when the more submissive skinks tail was missing and I promptly moved him into his own enclosure. Neutral ground sounds like a good idea, or even having the two enclosures next to each other, so the skinks can see each other, may assist. Although I would also assume that scent has a lot to do with how they get to know each other... so this may not be beneficial either. Introduced each other in the adult female's tub, and so far so good , the subadult boy has been more interested in trying to get out and is now exploring, my female has noticed but so far has given him the cold shoulder and is more interested in doing her usual routine things , basking , napping, soaking in her water dish, basking , raiding her food dish. There has been a bit of head-nodding going on , mostly from him. Will put him back in his tempory tub later this afternoon to go down for the night , or if I spot any aggression (I'm home all day today and will be monitoring the pair very closely). He was not easy to transfer back into his tub …. unlike my girl who is very tame and comes out to get a few bsfl & mealworms each day given by hand and enjoys a snuggle and even naps in my cupped hand , he's not happy about being handled and I had no choice but to chase him and grab him with my hand. Back in his temporary tub for now , and going to give him his own 149L ALLSET tub conversion until I can build a new 4ft L x 2ft W x 2ft T timber tank to house both of them . I plan to include provisions to have a slip in partition , so it will be easily subdivided into two mirror image sections for starters and when I'm sure both are fine with each other, I'll remove the Perspex partition. Suggestions on any improvements on medium grade Kritters Crumble mixed with Peet Coir and some leaf litter for their forever home's bedding ? Will an Arcadia T5 12% tube be too strong for these water skinks ? Set up another ALLSET 149L tub for my new subadult male , I've got the two water skinks' tubs next to each other so they can see each other for now while I get my materials sorted to build a 4'x2'x2' timber tank to house the pair . Wow !!! get a load of his VERY LONG VERY WIGGLY tail. I am making some progress with him , he now comes to take a cricket or a mealworm from my finger tips. Is going to take time and patience to tame him up like my girl. My little boy is getting very friendly and tame now (even lets my wife pet him when he's on me). Still keeping them separately , he's definitely interested in her but she is giving him the cold shoulder (ignoring him). Similar observations to GBWhite for me. I have at least a dozen or more Eulamprus tympanum living on the floor of my dragon rooms. They have been there for the last few years and like George I have noticed that they each have their own hide/sheltering area that they retreat to whenever I get too close. I have never observed fighting but I think that is because they have their own little territories that they seem to retreat to and guard. I have actually observed males chasing females for mating and last year and this year seen babies and youngsters running around on the floor indicating that they are breeding in my dragon rooms as well. They actually hang around my feet when I am feeding my dragons, because they pick up the woodies and crickets that I drop accidently to the floor. We also have wild roaches that they keep under control as well. I guess the thing that is immediately apparent to me is the space that they give each other which would definitely agree with Georges observations. They tend to be around 2 metres between each hide site and they generally control an area of about 1 metre square around their retreat/hide side. They will congregate in small groups of 2 or 3 around my feet but will always stay in a position that allows them to retreat straight back to their hide without crossing another's territory. The other individuals further into the room just wait (with their heads poking out or even their whole body) for me to get to their section of the room. Because I feed a lot of house flies and soldier flies to my dragons as well as the escapes and wild roaches, there seems to be enough food to sustain them. I do not throw them any food as quite honestly sometimes they get a little annoying under my feet all the time. I have to be mindful of where they are so I don't stand on them. So whilst they appear to be fairly social animals they do also seem to like their space and generally respect the space of other individuals. I would be careful putting 2 individuals into a confined space for a prolonged period even a male female combination. I would definitely keep my eyes on them and even when they seem settled I would still be wary. I have never kept these in enclosures the ones in my dragon rooms are literally wild animals taking advantage of human occupation as many animals seem to do. Interestingly, they don't even have access to sunlight, they seem to be OK with just the artificial lighting that I run for my dragons. I guess though if its working for dragons then it should work for sinks as well and appears to. We've regularly had 3 or 4 living under the rim of the sump under the back tap for a few months. When I place mealworms and dead crickets near the sump and I nearly always see 3 or 4 noses poking out and then they seem to take turns at taking the insects ( after I move about a metre away and sit quietly on the grass for a minute or so ). I'm assuming these are all related females. I give the wild lizards left overs (as well as the salad left over each day from my pet lizards) and freshly dead silkworms, mealworms, chopped superworms and fresh dead crickets , so they are well fed wild lizards in my yard.